The genesis of this work is a reflection of the European Quarter of Brussels and the European Parliament. After the direction of a short film with the same title and theme, and a site specific duet performance, the Europe Endless Project was altered and expanded into a duet for live stage performance. It is a live multi-media production that questions the work and lifestyle of the Eurocrats, crossing contemporary dance, performance and audiovisuals. Two Eurocrats women at their daily office work evolve inside a routine charged with endless power games, conflicts and perpetual bureaucratic nonsense in a tense atmosphere that cracks and deflates them. 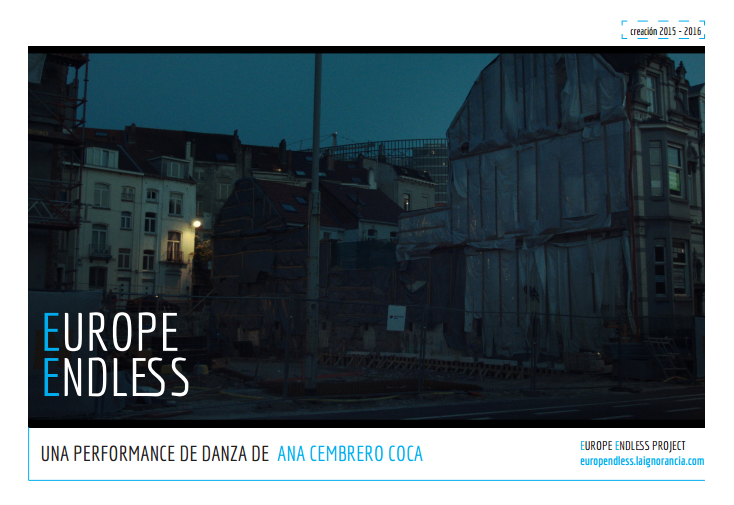 The stage version of Europe Endless began as a site specific at the BOZAR Old Masters’ Museum of Brussels as part of the program “20 young choreographers for Brussels” (February 2014). This was our first contact with a live audience. Later, a work in progress was presented at the experimental platform CURIOUSER Brussels organized by Veronique Van Meerbeek (May 2014). This was a crucial step at the development of the piece because we got the chance to exchange feedback and ideas with the audience and the artists that that participated in this platform. Finally, we developed the 30 minutes version of the piece in two periods: first, a research period during June 2014 at the Theater of the dance school K-Dance (Brussels) and a second and last period of rehearsals at the summer studios of P.A.R.T.S. Performing Arts Research and Training Studios (August 2014).